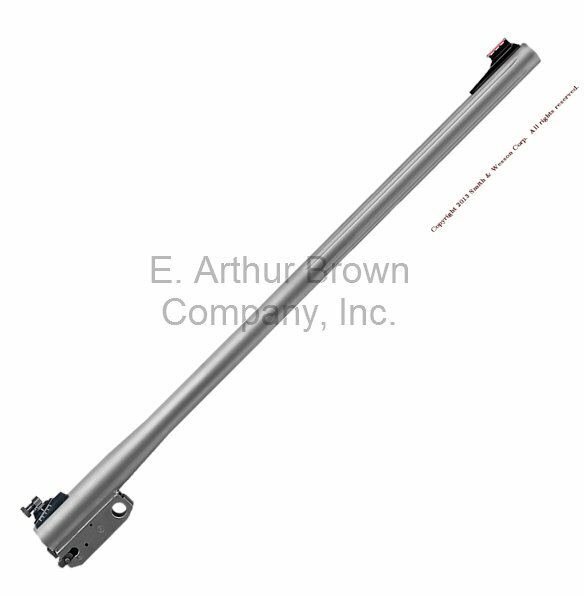 - Katahdin is a 20'', stainless, fluted barrel with adjustable peep sights. It fits Thompson Center Arms Encore and Pro Hunter frames. Drilled and tapped for scope mount. Use forends marked Katahdin or use Pro Hunter rifle forend or Encore 26" heavy contour forend. I just sighted in my 500 S&W barrel today and am totally pleased,other than the sight elevation screw that was missing but thats an easy fix. I purchased this Katahdin 500 S&W barrel & took it out to sight it in & to my surprise it was way off shooting 1 ft 6 inches high. I moved the rear sight as far as it would go & it still shot 6 inches high. I went home perplexed so I started checking the TC web site & noticed the photos of the barrels on the web site had a red fiber optic front sight on them. My barrel came with a green fiber optic sight on it. I called TC the next day & talked to customer service to see what was up. They had no clue what color sight is suppose to be on the barrel. I told them the pics on there site had red sights on the barrels & he also saw that so he decided to sent me the red sight & see if that will work. I got the front sight about 5 days later & it is almost 1/8 of an inch taller which is what the sight needs to be. Taller or higher. I put it on & will shoot it & let you know how it works out. I think it will be fine. If you get one of these barrels & it has a green front sight. Beware, it probably will not work. I do not blame Eabco for this. It's not there fault. Other than that. the barrel is great. Wanted the barrel to complement my S&W 500 mag pistol. Barrel arrived in perfect condition and mounted easily. Williams peep site was only 2 inches low and 1 inch right at 50 yards out of the box. Typical adjustments on the sights are somewhat tricky and require the use of a very small screwdriver so be prepared.